2nd Lieutenant, 1st Battalion, Foreign Service Dress, India, 1902. Lieutenant Colonel, Home Service, 1908. The 1st Battalion The East Surrey Regiment remained in India for nineteen years, though it was not deployed on operations. A number of individuals did gain experience in minor clashes on the North-West Frontier, however, and a draft joined the 2nd Battalion on operations in South Africa. 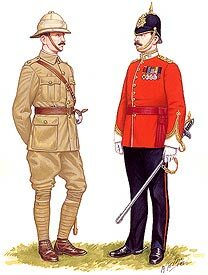 In 1903, the Battalion was posted to Aldershot and in July the old Colours of the 31st Foot were laid up in the Parish Church at Kingston. In 1905, the Battalion moved again; this time to Jersey, where it remained until 1908, then moved to Plymouth in 1909. Sergeant in frock, in India (2nd Battalion Review for the Prince of Wales, 1904). After various exercises on Salisbury Plain, the 1st Battalion moved to Kinsale, Ireland in 1910. 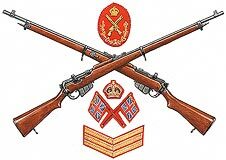 In the same year, another draft was sent to join the 2nd Battalion in Burma, whilst in 1911, a detachment represented the Regiment at the Coronation of King George V. Drafts continued to be sent to the 2nd Battalion and the 1st Battalion remained in Ireland until the outbreak of war. The 2nd Battalion moved from South Africa and arrived in Bombay, India to take over from the 1st Battalion at Lucknow in 1903. Some of the 1st Battalion soldiers remained in post and their local knowledge and experience proved invaluable. After two years, the Battalion was moved to Sitapur, where four companies were marched to the hill station at Raniket for ten months of duty. In November 1905, the Battalion moved to Mhow. Most of the 2nd Battalion’s tour in India was spent on field training and exercise and this resulted in a high state of efficiency. The next few years involved further training and moves to Rangoon, with detachments sent to Mandalay and Meiktila in Burma. Burmese service finished in 1913 and manoeuvres continued in India until the Battalion was sent to England in August 1914, ready for war.